Amazingly, a smart connected jacket will be released this spring called the Levis Commuter jacket, it allow users communicate with their smart devices with gesture moves.The project involves two parties, including Google and Levi’s, both giant worked together to make a product that’s not just fashionable but also technological friendly. Ability to make use of a Compass by swiping which will then trigger a voice assistant to inform it’s user based on the schedule set. Pause or skip or play a song that’s on your smartphone by double tapping your wrist. All these are possible as a result of the Jacquard tag attached to the jacket sleeve which also functions as a button. 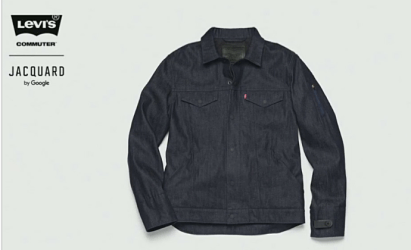 This Smart commented jacket happens to function like a smart wristwatch in some of its features.Google says it will add a third-party group to this Levi’s project. Also,Google plans to work with some other cloth producing companies without excluding athletic clothing companies and business dress makers in promoting Jacquard’s mission . In addiction to this, the smart jacket comes along with a phone app to aid the interaction between the user’s of the jacket and the phone.A Jacquard tag is attached to the jacket sleeve which can be removed and charged using USB cable to enable all this functions to work. The Levis Commuter jacket will not be restricted to do things that other fabrics can do like washing.This smart jacket seems fashionable, and it looks attractive. Hopefully, very soon this jacket will be out costing $350 when on sale.Though the release date have not being given it will be out this spring fall.